Now you don’t need airline fare and museum admission to view all 36 Vermeers. It used to be that the fastest, easiest way to view the paintings of Johannes Vermeer was a Google Image search. Now you can just download an app and view the 36 works widely attributed to the artist in an augmented reality museum from the comfort of your home. Nothing like taking in Art and Culture in your pjs. To view the Meet Vermeer virtual museum, you can download the free Google Arts and Culture app for iOS and Android. So long as you have a smartphone with a working camera, all you have to do is point your phone at a flat surface, wave it in a circle, and voila—you, too, can have a virtual museum floating above your bed and nightstand. After that, you can pinch and zoom on each of the seven rooms to “enter” the AR museum to view the paintings. Once inside, you can also tap on each painting to zoom in and view information about each. The museum can also be visited on desktops, but it’s not quite as cool, consisting of a series of virtual rooms instead of an AR experience. 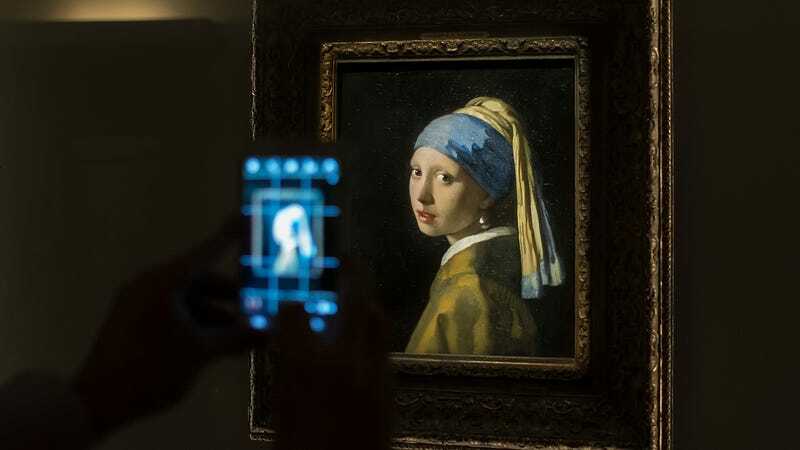 While it’s certainly novel to wander around an AR museum and view Art (with a capital “A”) in your pajamas, it’s also one of the only ways to view the entirety of Vermeer’s verified works at once. Barring a touring exhibition, you’d have to travel as far as London, New York, Paris, The Hague, and Amsterdam to view a majority of his publicly available works. Other paintings are locked up in private collections, some are too fragile to be transported, and “The Concert” is still MIA 28 years later. Plus, it’s unlikely that all 18 museums would ever be willing to part with their entire Vermeer collection for an extended period of time. This isn’t by any means the first time we’ve seen an AR-art mashup. It’s just that most attempts have felt tacked on, frivolous, or the exact sort of thing that makes people roll their eyes. Take Snapchat’s clumsy plans for an augmented reality art platform last year. It basically pinned giant AR Jeff Koons sculptures to locations and let users know when one was nearby so they could... take... photos of it? Meanwhile, the Meet Vermeer experience is legitimately neat. It’s an elegant use of technology that simultaneously creates an impossible experience while making highfalutin museum culture accessible to everyone. So yes, technically you could just google all 36 of Vermeer’s paintings. But at least this is a useful application of an emerging technology, instead of just another gimmicky stunt that feels like a solution in search of a problem.